After the fierce storm that could have taken Father Colleton’s life, he vowed to The Blessed Virgin Mary that he would build a church on the spot where he took refuge. Keeping that vow, he traveled to Kansas City to visit with the head of the land department of the Joy Railroad. After hearing the story of the vow, the land department gave Father Colleton 160 areas of land free of charge for the location of his church. 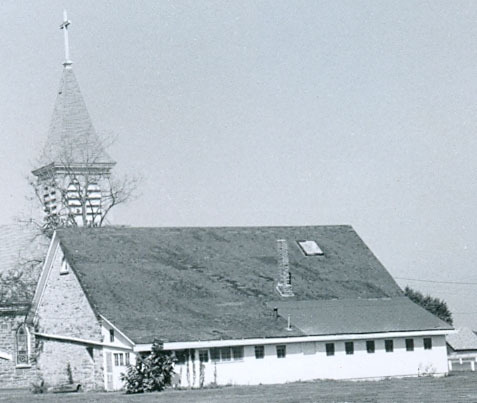 At that time he had planned to build a hospital in connection with the church, but his plan changed when he learned that another party had “jumped” the south eighty acres and planned to keep it. After this setback, Father Colleton lost his enthusiasm about the hospital project, but made good his vow by building a small wood frame structure which was completed in 1871 and became the center of a Catholic settlement and agriculture community primarily settled by French, Irish and German immigrants in the 1860s. Ironically in 1877, the church that was inspired by one storm was destroyed by another. The lumber from this church was sold and used in the construction of a farmhouse about 1 mile east of Greenbush. A second, larger, church was completed by all volunteer labor in 1881 (shown top right amid trees). It was made from limestone that parish members brought from an outcropping along nearby Hickory Creek. 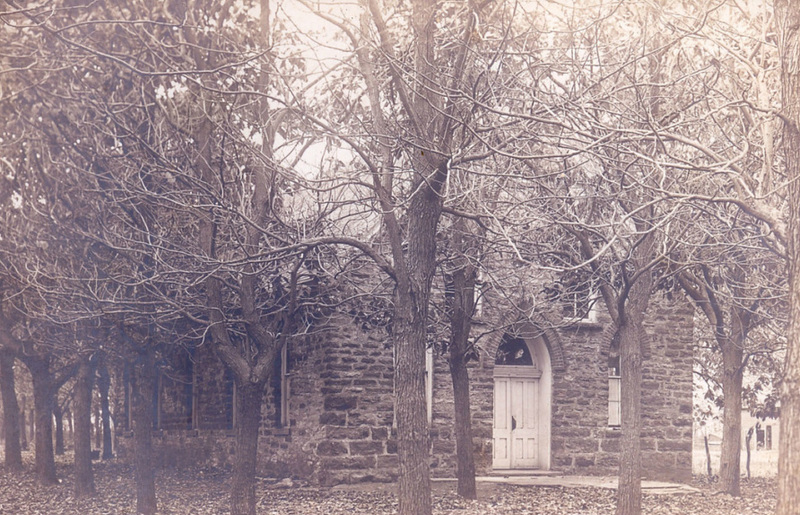 The country was being settled rapidly and outgrew this church, and a third church built of sandstone was started in 1903 and dedicated on July 12, 1907. At the time, it was the largest structure in Crawford County, with a cross soaring 125 feet above the ground. The magnificent structure stood for 75 years, until August 11, 1982 when it was hit by lightning. The church had just finished with renovations and parishioners were getting ready to move back into it. The 1881 church (second built church) was renovated into a place of worship. Stones from the burned church were incorporated into it. It was dedicated on March 9, 1986. 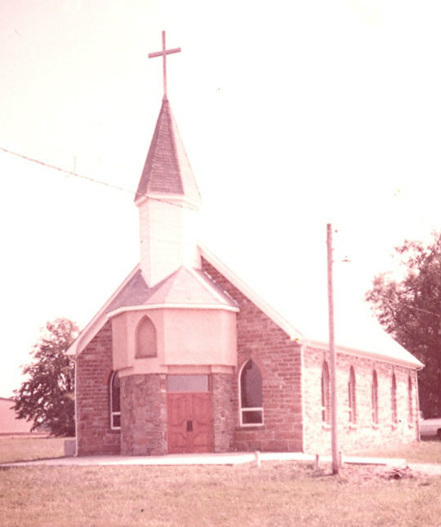 Due to a shortage of priests in the Diocese of Wichita, nine churches were close in southeast Kansas in 1993, and St. Aloysius was one of them. 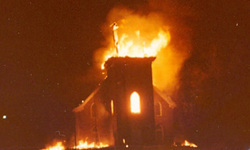 The last Mass was celebrated there on September 4, 1993, and the church was due to be sold or destroyed. 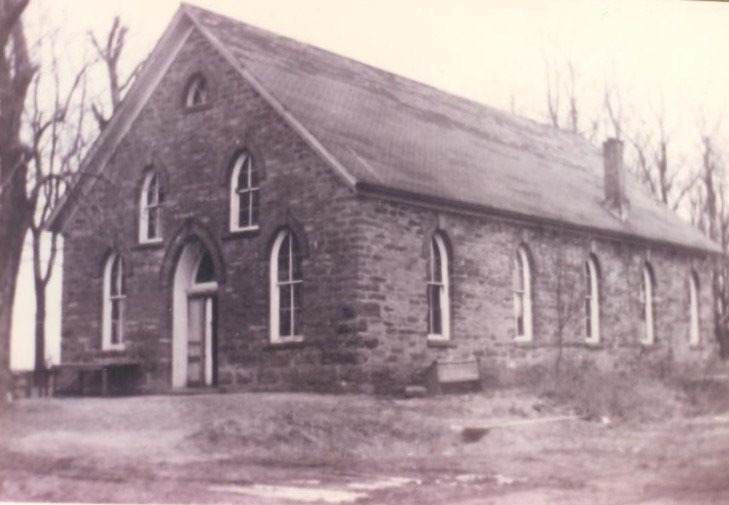 That was when the people of Greenbush, lead by Judy Jacquinot, rallied and formed St Aloysius Historical Society to preserve their heritage for future generations. With many hours of research and documentation, the property was approved by the Register of Historic Kansas Places in 1994. The Diocese still owns the land, but the historical society maintains the site and the cemetery. 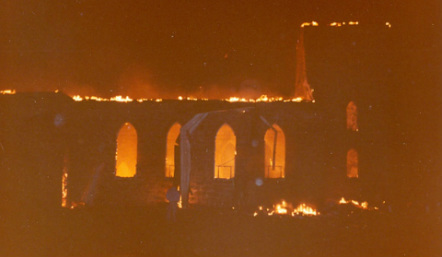 During the years before the fire in 1982, the second church was used as a hall and the upstairs loft as a classroom. An addition was built to the east side (shown above) with a kitchen to the south end and a classroom to the north end. Many families gathered here for activities held in this building including annual bazaar which featured a home cooked turkey dinner with all the trimmings and bingo making for a day that will be remembered for many years to come. The interior of the 1903 church (left top) reveals the massive size of the church with its beautiful altars and numerous pews. To the side of the main altar were four side altars, two shown here. The altar (left center) was dedicated to the churches namesake, St Aloysius Gonzaga (1568-1591) who is the patron saint of the young. The 1903 church was being remodeled when the storm stuck. 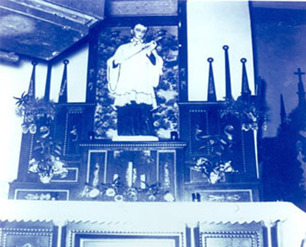 The photo (left bottom) shows the completed main altar four days before lightening hit the church.